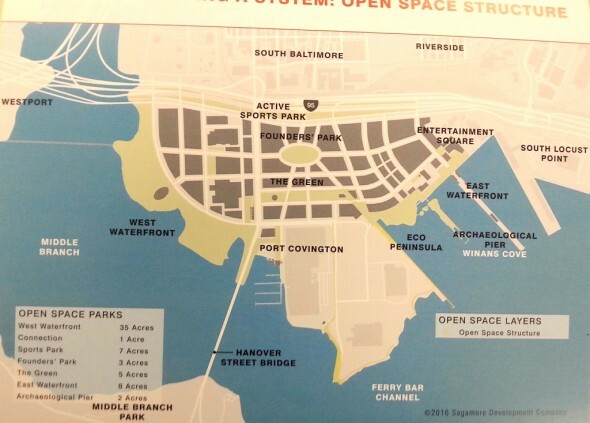 Above: “Park systems” map for planned Port Covington development. 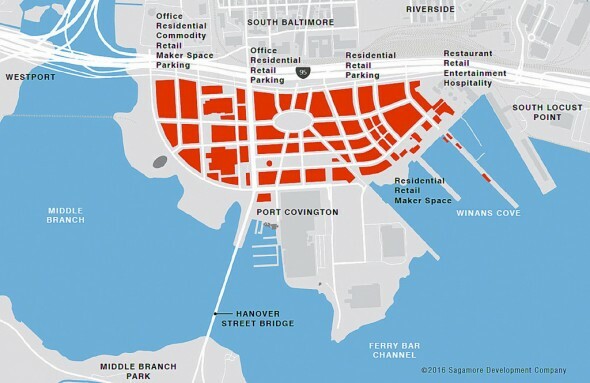 While Under Armour CEO Kevin Plank was buying up land in Port Covington over the past two years, questions surfaced about whether the mini-city planned to rise there would reduce public access to Baltimore’s waterfront. Would that shoreline property be “privatized” and put behind a wall solely for Plank’s employees and guests, like a gated community in the suburbs? 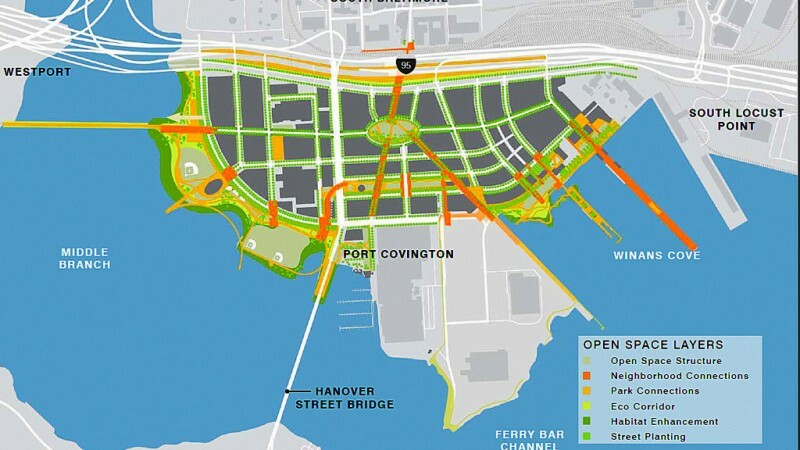 Or would it be open and accessible to the general public, like the seven-mile promenade along the Inner Harbor? 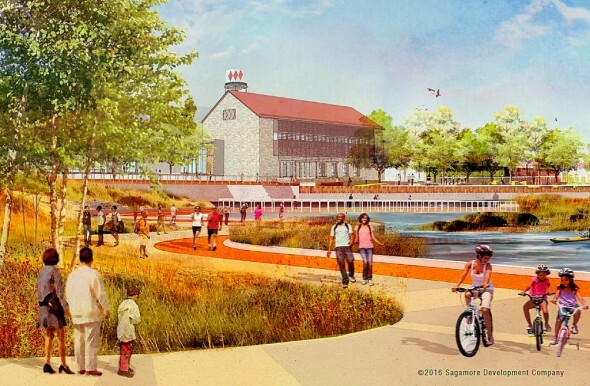 Plank’s real estate team went to great lengths to allay those concerns Thursday when it unveiled a proposed master plan to guide the revitalization of 266 acres along the Middle Branch of the Patapsco River over the next 20 years. During a two hour public presentation to Baltimore’s Urban Design and Architecture Review Panel, representatives for Sagamore Development Company, Plank’s real estate arm, said repeatedly that their goal is to provide continuous public access all along the water’s edge in Port Covington as part of a multi billion dollar redevelopment of the property that Sagamore has assembled. Colorful renderings of people sitting, strolling, jogging and biking along the water’s edge, supplemented their remarks. In their presentation, they showed pictures of other cities that boast public access to the waterfront. 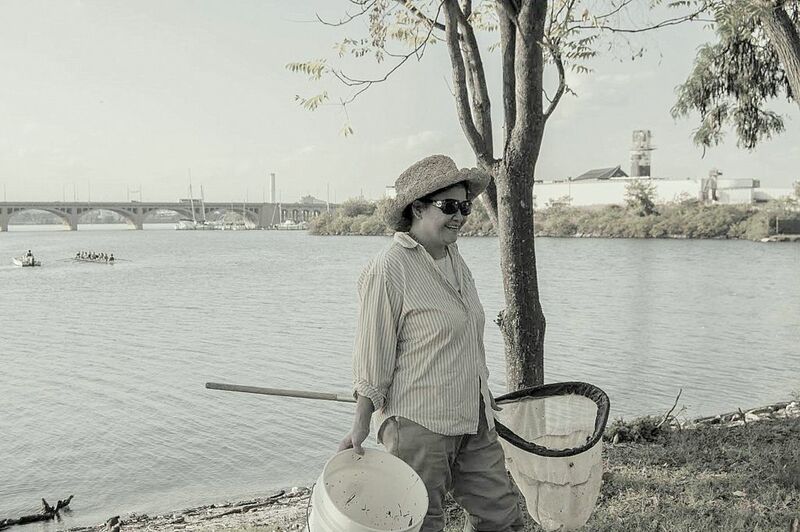 They introduced at least five consultants who specialize in working with various aspects of the public realm, including Biohabitats of Baltimore. There were caveats, to be sure, starting with the fact that Sagamore doesn’t own all the land for which it is making recommendations. And plans were not presented for the single most important piece of Plank’s waterfront, a 50-acre waterfront tract where he wants to build a new world headquarters for Under Armour. But the overwhelming thrust of the plan, the developers said, was to make the shoreline part of the public realm, even more so than it is at present. Because plans were not presented for the Under Armour headquarters portion of the project, targeted for a large peninsula that juts into the Middle Branch, there was little discussion about how the public would have access to that key site. Sagamore’s design group, led by Elkus Manfredi Architects of Boston, said that would come later. But designers did lay out their vision for land to the north, east and west of the headquarters site, including property along the water. In all, the plan will guide development of up to 13 million square feet of space. It calls for construction of what will essentially be a new mini city in south Baltimore, with housing, offices, hotel rooms, maker spaces, stores, restaurants and public spaces, including parks, squares, promenades and streets. For planning purposes, the land has been divided into several sub-districts, each with a different character. Helping define the different sub districts in the plan will be a series of public spaces. They include: an Archaeological Pier and Eco Peninsula, (2 acres or more); an oval space called Founders’ Park (3 acres); The Green (5 acres); and a Sports Park under I-95 (7 acres). Founders’ Park is a programmed space modeled after Bryant Park in New York. The Green could be anchored by horse stables for the city’s mounted police. Sports Park would be the site for “alternative uses,” such as skateboarding, basketball, BMX bike riding, and pop-up events. 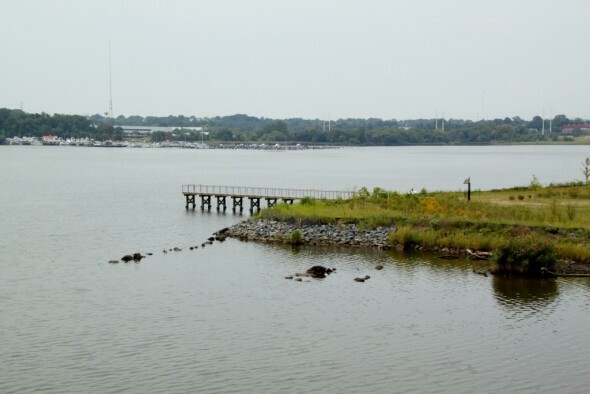 Framing it all, the developer said, will be a waterfront park system with trails and paths along the water’s edge, including a West Waterfront facing Cherry Hill (35 acres), and an East Waterfront facing Winans Cove (8 acres). One design and access issue is that some waterfront properties, most notably the Locke Insulators tract, are not owned by Sagamore and are currently off limits to the public. The same is true for some of the land near Nick’s Fish House and Grill, just east of the Hanover Street Bridge. West Covington Park, owned by the National Aquarium, was shown as part of the West Waterfront. So was Swann Park, one of two city owned parks that Sagamore has talked with the city about controlling in some fashion. Paff said some of the land that makes up the public realm may be publicly owned and some may be privately owned, but the intention of the master plan is to make it all seem like one seamless stretch of property, open and accessible to all. She said signs, lighting and other design features could be coordinated on both public and private land to make it seem like one unified environment. Paff said the design team has given much thought to shaping the public realm and making people feel welcome. Encouraging the use of mass transit, including more local bus service, a free “circulator” bus, four bike-share stations and two new light rail stations, is another design goal. 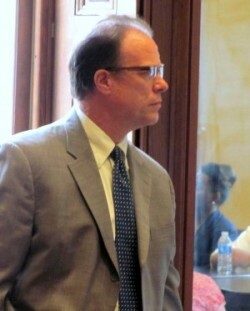 Transportation planner R. J. Eldridge promised that the community would be a virtual laboratory for different modes of transportation. Members of the design review panel praised the Sagamore team effusively for its sophisticated and enlightened planning approach, especially regarding the public realm. The photo above was taken by a Johns Hopkins University student, Jeffrey Nelson, as part of a class project for instructor Jennifer Bishop. The Brew will be featuring other photos from this class project in the coming weeks.